Location: Between Falcon Terrace and Main Road, just north of the road bridge over the River Tyne. Under 5 minutes’ walk from Wylam station. Present state: Demolished except for a length of edge stones from the 'up' platform. Notes: North Wylam station possessed two 130yd platforms. Acknowledging its greater importance than its neighbours and its de facto terminus status, North Wylam had brick buildings; but, like those at the other stations on the ‘loop’ they were uninspired, single-storey structures. The main building on the down platform contained (from west to east) a porters’ room, booking and parcels office, general and ladies’ waiting rooms, and a lamp-room with gentlemen’s behind, and a signal box on the platform, at the east of the building. The up platform had a pent-roofed enclosed waiting shed and toilet. Goods facilities were south of the main building. About 1960 a concrete footbridge was added to the ensemble. Until closure the station was gas-lit, and it was the only one on the loop line that definitely had BR totems installed. The goods service was withdrawn from 1st January 1961 and despite heavy passenger usage North Wylam closed in 1968. In the previous year 34,698 tickets were sold, the figure inflated by the temporary closure of Wylam during 1967. 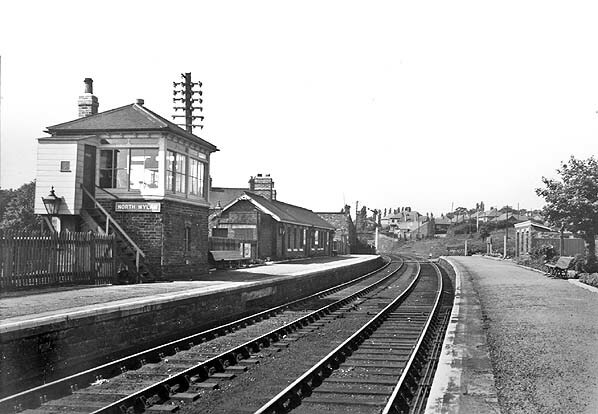 When the rails through North Wylam were removed in 1972 the station was still substantially intact. 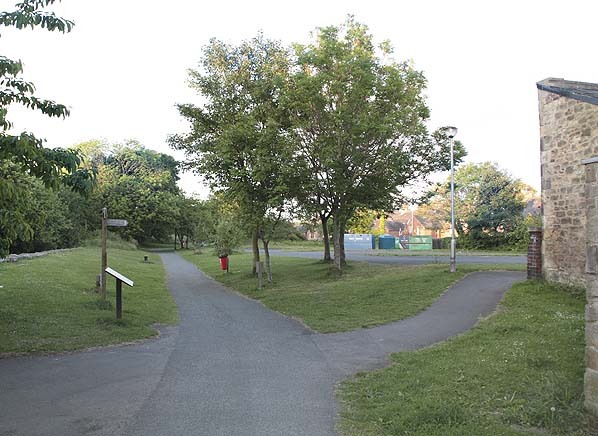 The site was cleared in January 1975 since when all signs of North Wylam station have been erased from the landscape. presented to Parliament, and the line opened from Scotswood to Newburn, with an intermediate station at Lemington, on 12 July 1875. 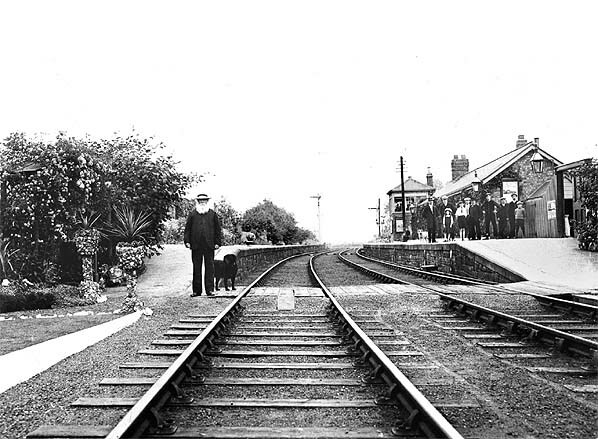 The remainder opened as far as North Wylam station on 13 May 1876 then onward across Wylam Bridge to meet the route via Blaydon at West Wylam Junction in October 1876. Part of the 6½ mile route followed the course of the Wylam Waggonway. This section passed the cottage where George Stephenson was born; the proximity of this waggonway to his childhood home undoubtedly inspired his pioneering interest in railways. Each end of the new line offered engineering challenges. At Scotswood a ridge was to be crossed in a cutting, but, owing to geological difficulties, a short tunnel was excavated instead. At the west end, the River Tyne was crossed by the graceful Wylam Bridge. Closely resembling Newcastle’s Tyne Bridge, built 52 years later, Wylam Bridge was of wrought iron and had an 80yd arch from which the bridge floor was suspended on vertical ties. The dock in the company’s title was never built because the River Tyne was too shallow and was not dredged as far upstream as Scotswood. 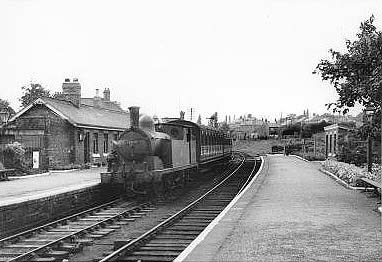 Despite being a loop line, passenger trains from Newcastle generally terminated at North Wylam, a practice that continued until the 1950s. In 1889 a complaint by a passenger, whose journey from Heddon involved a transfer with luggage between Wylam’s stations (about a quarter of a mile) to reach Prudhoe or stations west, failed to impress NER officials. The working timetable of winter 1898-9 shows six passenger trains each way between Newcastle and North Wylam (terminus) at irregular intervals, with an extra market train on Tuesdays and Saturdays leaving Newcastle at 7:55 pm and North Wylam at 8:39 to return to Newcastle, and a Thursday-only 10:35 pm departure from Newcastle to North Wylam. A workmen’s train (Saturdays only) left Newburn at 12:25 pm for Newcastle. The two further passenger workings were Saturday relief trains from North Wylam (dep 1:25 pm) to Newcastle and a 7:40 pm (alternate Saturdays) in the opposite direction. Goods train workings were also apparently confined to the section east of North Wylam, although an express meat train leaving Carlisle London Rd at 4:55 pm was routed along the loop. Otherwise the Wylam Bridge presumably carried only mineral trains. In 1920 ten trains operated each way on weekdays between Newcastle and North Wylam. By winter 1937-8 the service had strengthened to approximately half-hourly trains on weekdays and hourly on Sundays: some weekday, and all Sunday trains, did not call at Heddon-on-the-Wall. Eventually, in 1955, British Railways promoted the loop to ‘through status’, with several passenger workings daily over Wylam Bridge. For many years some trains (passenger and freight) had actually used this route because it quadrupled the congested Prudhoe-Scotswood section. The 1955-68 passenger trains on the route were at irregular intervals. Sunday trains used the North Wylam loop in its final months, rather than calling at Blaydon and Wylam. 37,197 tickets were issued there, but less than 25,000 for the other three stations combined. At that time, moreover, North Wylam was effectively a terminus with negligible traffic to or from the west. Its bookings exceeded those at Wylam (30,261). Beeching (1963) recommended closure of thirteen Newcastle-Carlisle passenger stations including Scotswood and North Wylam, but (according to Map 9 in the report) ‘stopping’ passenger services would continue to use the North Wylam loop – with no station remaining to stop at! - whilst ‘stopping’services would cease to use the route via Blaydon, and Wylam and Blaydon stations would close. ‘express’ services with Newcastle-Hexham local workings. North Wylam station was to remain open, and the Blaydon route would close. B.R. explained this decision, noting the expense of maintaining Scotswood Bridge;‘certain advantages’ of the North Wylam route for freight working; declining business at Blaydon; and the ease of transferring Wylam’s business 300yd to North Wylam. B.R. considered the retained stations ‘fairly well placed strategically to attract people to use their cars to the stations and go forward on fast trains to their destinations’. Trains between Scotswood and Prudhoe via Wylam were suspended from 3 September 1966 for engineering work. They never again stopped at Scotswood’s south platforms. The North Wylam loop platforms remained as the notional railhead for the temporarily-closed Blaydon station, beyond the expected closure date in early January. Scotswood eventually closed in May 1967, when services via Blaydon were restored. Because BR’s proposal in 1966 to close Wylam but retain North Wylam was rejected, proceedings began in 1967 to close the North Wylam loop. 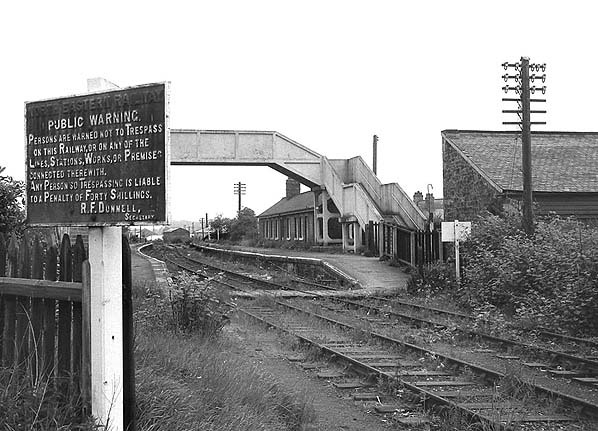 North Wylam station was profitable, with annual passenger receipts of £4,650 against operating costs of £2,100, but abandonment from North Stella (Newburn) to West Wylam Junction, including the bridge over the River Tyne, would save an estimated £8,500 in maintenance and renewal. Whereas BR emphasised the operating advantages of the North Wylam loop a year earlier, now, remarkably, its disadvantages emerged: North Wylam had speed restrictions owing to ‘sharp curves, gradients, and poor foundations’ (maximum gradient was a very short stretch at 1 in 85) and would be expensive to upgrade to trunk route standards! 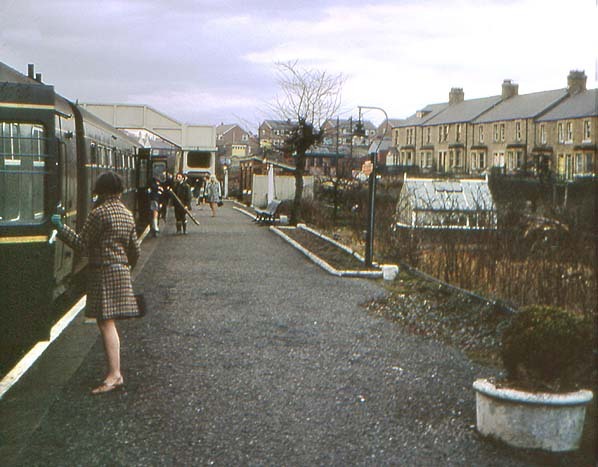 of 12 September 1967 concluded that Wylam (population 1,495) did not warrant two stations, and that passengers used either station ‘according to which particular train suited their immediate requirements’. 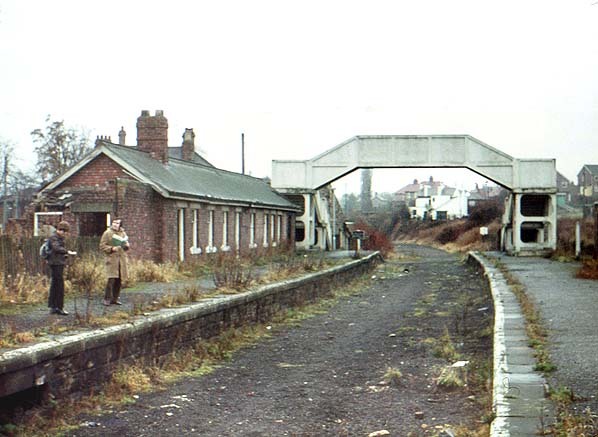 On 11 March 1968 passenger traffic ceased on the loop and North Wylam closed. I travelled on two of the trains on Saturday 9 March (the penultimate day of service). There was a sense of ‘business as normal’ – no signs of impending doom, or special events as were seen on some other lines immediately prior to closure. Rails through North Wylam were retained until April 1972, when the line was cut back to Newburn. The Scotswood-Newburn section was taken out of use in December 1986. 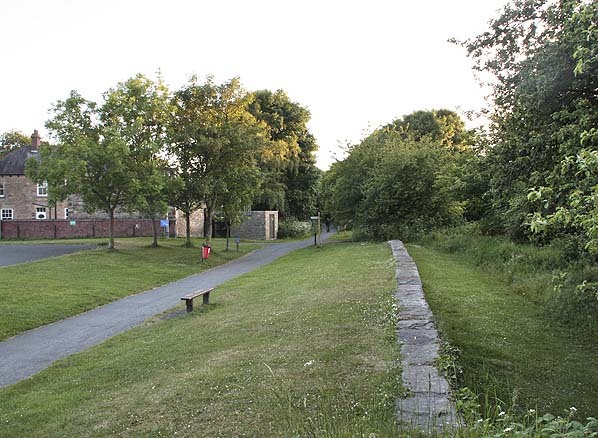 Most of the loop is now a cycle route and footpath (Tyne Riverside Country Park) with Stephenson’s Cottage as an enduring feature of interest. Railways in Northumberland by Alan Young (Pub: Martin Bairstow 2003) from which this article is adapted. North Wylam Station looking north east in June 2009. taken from a similar viewpoint to the 1971 picture above. The building on the right can be seen in both pictures. North Wylam Station looking south west, edge stones from the 'up' platform remain in place.